Name of an order of the Mishnah and the Tosefta both in Babli and in Yerushalmi. 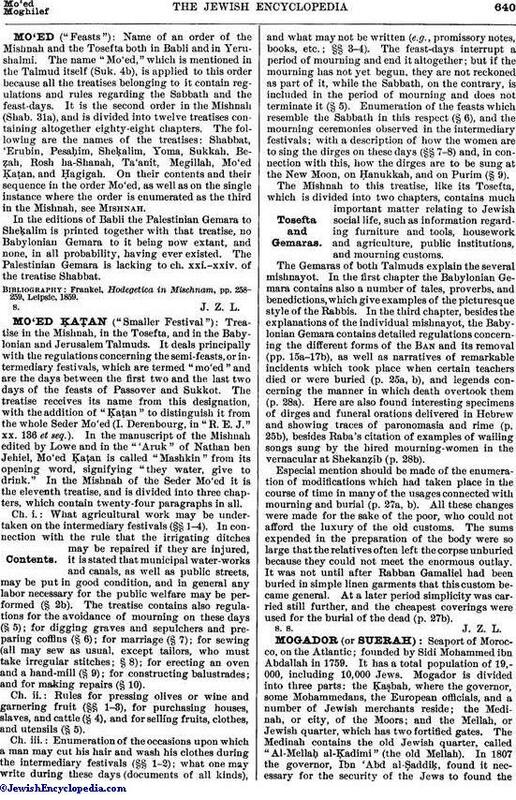 The name "Mo'ed," which is mentioned in the Talmud itself (Suk. 4b), is applied to this order because all the treatises belonging to it contain regulations and rules regarding the Sabbath and the feast-days. It is the second order in the Mishnah (Shab. 31a), and is divided into twelve treatises containing altogether eighty-eight chapters. The following are the names of the treatises: Shabbat, 'Erubin, Pesaḥim, Sheḳalim, Yoma, Sukkah, Beẓah, Rosh ha-Shanah, Ta'anit, Megillah, Mo'ed Ḳaṭan, and Ḥagigah. On their contents and their sequence in the order Mo'ed, as well as on the single instance where the order is enumerated as the third in the Mishnah, see Mishnah. In the editions of Babli the Palestinian Gemara to Sheḳalim is printed together with that treatise, no Babylonian Gemara to it being now extant, and none, in all probability, having ever existed. The Palestinian Gemara is lacking to ch. xxi.-xxiv. of the treatise Shabbat. Frankel, Hodegetica in Mischnam, pp. 258-259, Leipsic, 1859.